It’s hard to believe that a few years ago, Uber was just an adjective and not the all-purpose car service app on everyone’s phone. Here’s another word whose meaning could soon be transformed: Reserve. The people that brought you Uber have launched a new app that helps you book a table at some pretty cool restaurants in New York City, Los Angeles and Boston right now, with more cities soon to come. Here’s what you do: Download the Reserve app. Scan your credit card—and a selfie, if you want the maître d’ to greet you by name when you walk in. (What will happen if you download Leonardo di Caprio or Karlie Kloss’s picture I wonder?) Pick the restaurant and the number of people and optimal time for your meal. Then get ready to start receiving text updates on your reservation status. If you’re first choice doesn’t work out, they’ll help you look for another. The list of NYC restaurants is currently short but valuable with hard-to-book places like Carbone and ABC Kitchen in the mix. Back to the Uber similarities: When you’re ready to leave, you don’t wait for the check; it’s deducted from your credit card along with a tip amount you’ve designated and a $5 flat fee to Reserve. 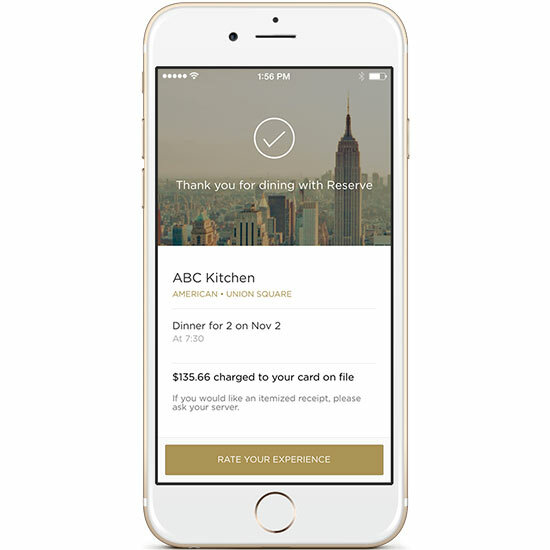 So Reserve, welcome to the busy world of reservation apps—which includes Open Table and Resy, whose motto is ‘Kiss the 6.30 or 10 treatment good-bye.’ It’s not just an exciting time to be eating at restaurants. It’s an exciting time to be making restaurant reservations.